More than forty years after the singer’s death, the world’s fascination with Elvis Presley shows no sign of abating. With tens of thousands of Elvis impersonators in just about every corner of the planet, his songs can still be heard in discos, weddings, karaoke bars and cabaret. Whether it is the high camp of his latter Vegas years or the bluesy sounds of the 1950’s, his influence over global culture remains high. So it should come as no surprise that items owned by the icon should fetch such large amounts at auctions well into the 21st century. Elvis was not a man known for understatement. 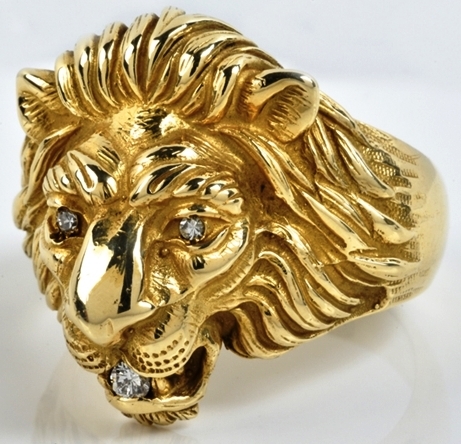 Gold made up a large part of his wardrobe and possessions, one of which was a gold ring that depicted a lion’s head. The ring had diamonds for eyes and was 14 carats, not the purest, but still large enough to be valuable for the gold content alone. It is thought that the man himself wore the ring around 1972 when at his home, and temple to Elvis fans worldwide, Graceland. The ring was actually damaged when a friend of the singer, part of the “Memphis Mafia”, trod on it when the ring fell off Elvis’ finger. Elvis reportedly gave the ring to a cousin of his and told her she could keep it if she got it repaired. While it seems the ring never was taken to be repaired, this only adds to the intrigue for collectors, who often site damage to possessions owned by iconic figures as bringing them closer to them. The ring sold for £35,000 at auction in Devizes, Wiltshire. Auctioneers, Harry Aldridge and Sons, also presented the ring with a certificate of authentication, which is only to be expected if a collector is going to spend tens of thousands of pounds on such an item. It is reported that the buyers are from the United States, but based in the UK. They are also reported as paying almost £30,000 for Presley’s first Vegas contract, which dates back to 1958 and refers to a $7,500 a week payment. Both items have been described as “fantastic pieces of iconic showbiz memorabilia”, by the auctioneers, and it seems at least one collector concurred. Plummeting Value Of Elvis Memorabilia? It has been reported by many that Elvis memorabilia is dropping in value, with rarities often fetching as little as 50% of predicted price when it comes to auction. The reason for this is thought to be that many Elvis fans are simply dying off. This coupled with he fact that large collections then find their way to auction afterwards means the price of such memorabilia has dropped significantly in the last decade. The fact remains, however, that Elvis memorabilia is still highly valuable, and much of the most valuable items are precious metals and gemstones, which the singer collected at a frightening rate. Take, for instance the diamond ring the singer gave to a member of the audience in 1975, which sold at auction for more than $100,000 in 2009. While the ring’s gemstone value alone was high, the association with “The King” certainly helped. One of Elvis’ most common phrases was “Taking Care of Business”, which came about because he was a fan of the Bachman Turner Overdrive song of the same name. Latterly, “The King” gave his backing band the same name and had the letters “TCB” printed on his private jet. He also had several necklaces, made from diamonds and gold, depicting these letters, one of which he gave to his personal physician. In 2009, this sold for a mammoth $121,000. But nothing beats the ultimate in Elvis bling. In 1955, in the singer’s early career, he bought his mother a grand piano, which he soon discovered he couldn’t get into her apartment. Taking it back to Graceland, his wife, Priscilla, took it out of storage and had it covered in 24 carat gold leaf. In 2015, it sold at auction for £600,000.